This is my mothers recipe that I remember well while growing up. It has been cut down a bit since most people are not feeding a family of 10. It is very easy to adjust to the number of people you are having for dinner. I like to make extra so the next day we have an easy meal with hardly any preparation. In a large stockpot, combine the potatoes, celery, onion, carrots and chicken stock. Bring to a boil, cook over medium heat until potatoes are tender. Stir in salt and pepper. In a separate saucepan, melt butter over medium-low heat. Whisk in flour with a fork, and cook, stirring constantly until thick, about 1 minute. Slowly pour in milk to avoid lumps to form until all of the milk has been added. Continue stirring over medium-low heat until thick, 4 to 5 minutes. Slowly stir the milk mixture into the stockpot, and cook soup until heated through. Serve immediately. Try Garnishing with pinch of shredded cheddar cheese or chopped parsley. 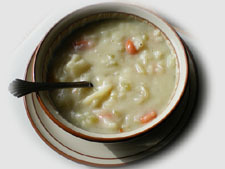 For Potato Soup with Ham add 1 1/2 cups cooked diced ham to the cooking vegetables. For Cheesy Potato Soup add 1 cup shredded cheese at the end as a final ingredient. In soup stockpot, heat oil and margarine on medium until margarine melts. Add leeks and cook 8 to 10 minutes or until tender, stirring occasionally. Stir in potatoes, broth, dill sprig, salt and pepper. Cover and heat to boiling on high. Reduce heat to low; simmer 15 minutes or until potatoes are very tender. Ladle potato mixture into blender in 3 batches. Blend until all is pureed. Return all the pureed soup to the pot and stir in milk. Heat through. Stir in chopped dill and lemon juice. In a stockpot, over medium-low heat, cook the flour and butter, stirring constantly until roux achieves a light caramel color. Add the broth and brown sugar, bring to a boil, then lower to a simmer. Stir in the sweet potatoes and spices, bring to a simmer again, and cook for 5 minutes more. In a blender, puree the soup in batches and return to stockpot. Add the milk, and reheat soup. Season with salt and pepper, serve immediately in warmed soup bowls. Tip: When blending the hot soup Remove the center part of the blend cover so heat can escape otherwise you will end up with a mess. You may also want to cover the cover with a paper towel as it might splatter with the open cover. Serving Suggestions: Serve with warmed Italian bread and a salad for a complete meal. The fun about cooking is having a variety of different ways to prepare a dish. Your family never gets bored and teaches them to keep an open mind to the many different flavors available. I am sure there are many other variations of Potato Soup Recipes, so if you have one you would like to share, please send it in. I would love to try it out and add it to my site. Just click "SHARE A RECIPE" on the menu bar. or click here.